This page contains information about the AACOM Application Service (AACOMAS) but does not contain application instructions. To successfully submit your application, you must read all online application instructions. The American Association of Colleges of Osteopathic Medicine Application Service (AACOMAS) is the centralized application service for U.S. osteopathic medical schools. AACOMAS enables applicants to complete one application and submit it with required information to programs participating in the centralized service. AACOMAS verifies your coursework for accuracy and sends the application and supplemental materials to the medical colleges you designate in the application. The service reduces the number of initial application forms, transcripts and fees required and streamlines the verification of your academic information. The college information section of the College Information Book can be used as a reference in learning more about the participating medical colleges. It contains a profile of each college of medicine, including a brief description of the campus and the curriculum, admissions criteria, minimum entrance requirements, class size and enrollment, supplemental application material requirements, and application deadlines. For further information and updated tuition and fees, you should visit each college’s website to view their most recent catalog or contact the colleges directly. Information in this resource is subject to change. The colleges reserve the right to alter requirements for admission at their discretion. The online AACOMAS application is located at https://aacomas.liaisoncas.com. AACOMAS supports the latest versions of all major Internet browsers. To successfully complete the AACOMAS application, you must review all online application instructions in addition to the content of this publication. View the application instructions. 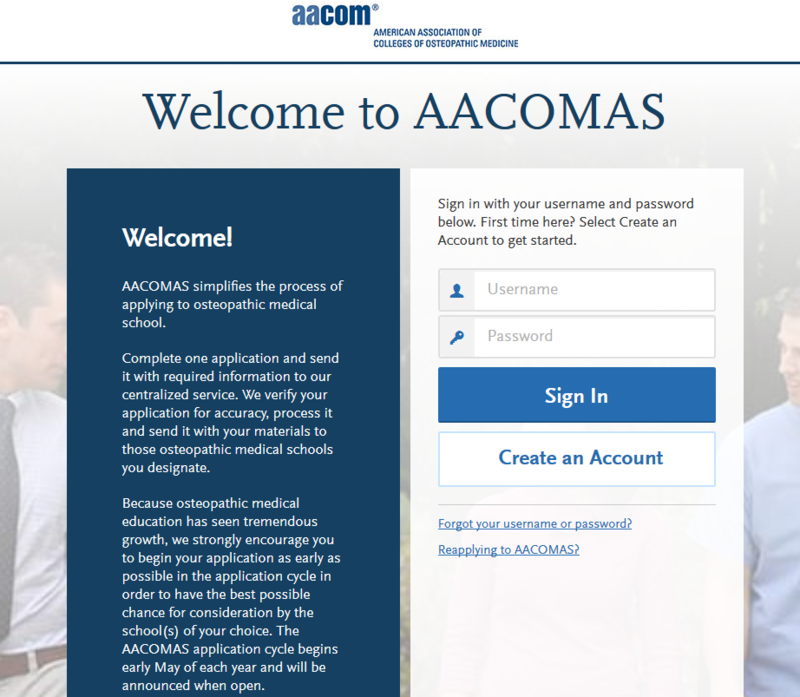 The AACOMAS online application is designed to easily guide applicants through the osteopathic medical school application process. Colleges of medicine require official scores from the Medical College Admissions Test (MCAT). You must contact AAMC to have your official MCAT scores released to AACOMAS. MCAT scores are not released to AACOMAS automatically. Once released, MCAT scores are sent to AACOMAS electronically from AAMC and matched to your application using your name, date of birth, and AAMC ID. Paper copies are not accepted. Log into the MCAT Score Reporting System and select American Assoc. of Colleges of Osteopathic Med. App. Serv. as a recipient of your scores to ensure that your scores will be transmitted to AACOMAS. Your MCAT is transmitted electronically to AACOMAS and is linked to your AACOMAS record using your full name and the eight-digit MCAT/AAMC number assigned when you register for the MCAT. Be sure that you accurately enter the eight-digit MCAT/AAMC number in your AACOMAS application. Providing the wrong number, name, or date of birth will delay the transmission of your scores to the colleges. It takes approximately 10-12 days to process official MCAT scores once they are released to AACOMAS from AAMC. You are required to report to AACOMAS all institutions attended, including but not limited to: college-level courses taken in high school, summer courses, community college courses, undergraduate institutions, military institutions, postbaccalaureate, graduate, and doctoral work, study abroad, foreign work, etc. Failure to report an institution or any courses taken at an institution runs the risk of your application being sent back to you by our verification staff who will require you to report and provide a transcript for the missing institution or course(s). This can significantly delay the processing of your application. You must request the registrar of each institution you have attended to submit one complete set of official transcripts directly to AACOMAS. Include all institutions in foreign countries, U.S. territories, and possessions that are operated by U.S. institutions. Student copies of transcripts or copies sent by the applicant are not acceptable. Transfer credit(s) appearing on a transcript cannot be accepted in lieu of an original transcript from the institution where the coursework was completed. See the online AACOMAS instructions for more details on submitting Foreign, French Canadian, Study Abroad, and Overseas transcripts. It is the applicant’s responsibility to meet compatibility requirements for computer systems involved in the application process. Requirements for AACOMAS online include Internet access and a web browser that is configured to allow pop-up windows and other features of the secure online application. (Pop-up blocking software must be properly configured or turned off.) In addition, the email address that you provide should not filter out communications regarding your application. (Spam filtering must be properly configured or disabled.) Please use a permanent email address, not one that will expire when you graduate. The fee for using AACOMAS varies according to the number of colleges you designate when you submit your application. You may subsequently request that we send your application to more schools after intial submisssion. Payment may be made by credit/debit card only. Application materials will not be processed until payment is received. Currently, the application fee is $195 and includes submission to one designated college. Add $45 for each additional designation. Applicants may apply to those osteopathic medical colleges that offer an Early Decision Program (EDP) and will be informed about the outcome of their application early enough to apply to other schools through the regular process. EDP applicants agree to apply to only one medical college through the process. If offered an EDP acceptance, they must attend that college. AACOM encourages each of its member colleges to conduct an application process that is inclusive and professional. The purpose of these guidelines is to allow prospective students to explore their options with the osteopathic medical community and to give the colleges of osteopathic medicine (COMs) the ability to process, select and matriculate applicants in a fair and timely manner. COMs will publish and follow an application schedule. COMs will publish their respective application procedures and admission requirements. Those accepted prior to November 15 will have until December 14. Those accepted between November 15 and January 14 will have 30 days. Those accepted between January 15 and May 14 will have 14 days. Those accepted after May 15 may be asked for an immediate deposit. After May 15 of the year of matriculation, each medical college may implement college-specific procedures for accepted students who hold one or more seats at other medical colleges. Starting April 1, osteopathic medical colleges are asked to report to AACOMAS the names and identification of candidates who have paid a deposit, hold a position at an osteopathic medical college entering class or both. After May 15, AACOMAS reports to each institution the names and candidates for its entering class who hold an acceptance(s) at additional institutions. An osteopathic medical college may rescind an offer of admissions to a candidate who has paid deposits to or holds positions at multiple institutions. If the osteopathic medical college chooses to withdraw the candidate from the entering class, the college must give the candidate a minimum 15-day notice. After the 15-day notice, if the candidate does not respond and is withdrawn from a college, the deposit is forfeited, and the seat may be given to another candidate. Therefore, prior to May 15, applicants need to withdraw from any college(s) which they do not plan to attend and only hold a position at one COM to avoid having positions withdrawn. Prospective osteopathic medical students are expected to provide factual, accurate and complete information throughout the admissions process. AACOM believes that the process requires mutual respect, integrity, and honesty among the COMs, and between colleges and their prospective osteopathic medical students. Many programs have strict guidelines for submitting letters and requirements vary from school to school. Be sure to check with each osteopathic medical college before submitting letters of recommendation. For more information about submitting letters directly through AACOMAS, please refer to the online AACOMAS Application Instructions. Applicants aspiring to become osteopathic physicians are expected to act professionally in their interactions with AACOMAS and with each college of medicine. Responsibility, respect, good judgment, professional communication, and cooperation are qualities that are valued by the osteopathic medical profession, and it is expected that applicants will demonstrate these qualities throughout the application process. Applicants are expected to become familiar with admission requirements, follow application procedures, and meet all deadlines at each school to which they apply. Applicants are responsible for the collection and timely submission of supplemental applications, letters of recommendation, transcripts, and all applicable fees. All candidates who submit a supplemental application and subsequently complete the application process (submitting all required materials) are considered for admission by the colleges to which they submit a complete application. Applicants are encouraged to review the online application instructions and the colleges’ online program pages to determine the standards and processes for the colleges to which they are applying. Applicants are responsible for reporting and updating any changes in the initially submitted application (e.g., address, telephone number, academic status, and state of residence). Applicants are responsible for responding promptly to all interview invitations and offers of admission (either to accept or to decline). Applicants who have made a final decision regarding the medical school they plan to attend have an obligation to promptly withdraw their applications from all other schools. To submit an application, applicants must agree to the certifications and conditions published and available for review in the AACOMAS application and online application instructions. Apply early and read all application directions carefully to avoid delays. Application processing begins in June. Colleges of osteopathic medicine make admissions decisions on a rolling basis, so they review applications, conduct interviews, and make admissions decisions throughout the admissions cycle. Keep in mind that interview slots may be awarded and/or classes may be filled if you apply close to the deadlines. Submitting materials early and accurately will support timely processing and help avoid delays. Your AACOMAS application must be submitted and all official transcripts for completed coursework must be postmarked on or before the college application deadlines.